Vidme, a video sharing application which is a lot an Imgur for video, as it also has a strong connection with the Reddit community, has raised $3.2 million in new funding, the company is announcing this morning. Investors in the seed round include Mark Suster of Upfront Ventures, Reddit co-founder Alexis Ohanian of Initialized Capital, First Round, Lowercase Capital, SV Angel, Mucker Capital, Launchpad, and others. The video service was one of three projects created by Bit Kitchen, a product lab founded by Alex Benzer, previously the founder and CEO at L.A.-based SocialEngine, and Warren Shaeffer, previously COO at SocialEngine. The team was putting together projects and releasing them into the wild to see what user response would be, but it was Vidme which ended up taking off. By January 2014, the site had racked up 140,000 uniques in its first month, thanks in part to members of the Reddit community who used the site as a quick and easy way to share a video with their posts. Today, says Benzer, Vidme has grown to over 30 million uniques per month. The co-founder says investors were largely drawn to Vidme because the service offers an interesting differentiator in the video space, and has been demonstrating early traction. Plus, he notes, the demand for digital video content today is huge, and the market is growing quickly. “There’s this tidal wave shift of people consuming content on their phones, and [investors wanted to fund] a team that’s thinking about that all day and coming up with innovative ways to re-imagine both the discovery experience and creation experience as well,” explains Benzer. What makes the service compelling, compared with alternatives like Vimeo or YouTube, for example, is its simplicity. All you have to do is browse to a video file or GIF, drag-and-drop one from your PC or just paste in a URL. Meanwhile, Vidme’s mobile app lets you upload files right from the gallery on your phone. After the video is uploaded, you can share the Vidme link to social networks and elsewhere, including posting it on Reddit. Most of Vidme’s growth has been driven by the utility of one-step video uploading, says Benzer. However, what’s also notable about Vidme is that it doesn’t require users to register with their social profiles, email addresses or phone numbers (though Facebook, Twitter and email are optional). Instead, you only have to pick a username and password when signing up. But you don’t have to create an account to upload – you can also do so anonymously. The videos are associated with your device, however, so you can pull them down later if you choose. 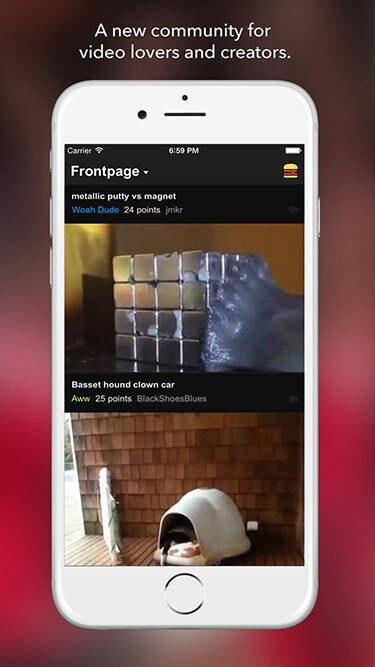 More recently, Vidme has rolled out additional discovery features on its network, including its own “front page” showcasing popular videos which refresh daily. The company now sees the potential for Vidme to function somewhat like a video magazine, we’re told. And, taking inspiration from Reddit, it’s even adding moderators for its various categories. To date, Vidme users have uploaded a wide range of content to the site, including live footage of a somewhat news-y nature, personal videos, and a range of other content that Vidme has sorted into dozens of categories – some of which are reminiscent of those you would find on Reddit or Imgur. The default networks include categories like Animation, Awesome, Aww, Drones, Funny, Trees, WTF, and more. But elsewhere, there are even more categories, ranging from entertainment to tech to sports to Minecraft and many others. Some users are sharing their Snapchat Stories on Vidme, while others are using it to collect GIFs. But largely, the videos are entertaining in nature. “We’re building towards being a new entertainment platform, a creator-friendly community and a very meritocratic place for content to get discovered and rise to the top,” says Shaeffer. The company is now investing in creator tools, including a new mobile app that will allow users to create a “unique kind of video,” the co-founder hints. He says the company is also developing its API, which allows third-party sites and other developers to build on top of Vidme. Some potential use cases are apps for other platforms, or integrations into other websites, for example. Eventually, the company hopes to generate revenue through native ads, not pre-roll, but that’s further down the road. In the near-term, the team is focused on improving its experience on Android with a better application that’s more like the current iOS build. Vidme is a small team of six in L.A. Its iOS application, which was updated earlier this week, is available on iTunes here.